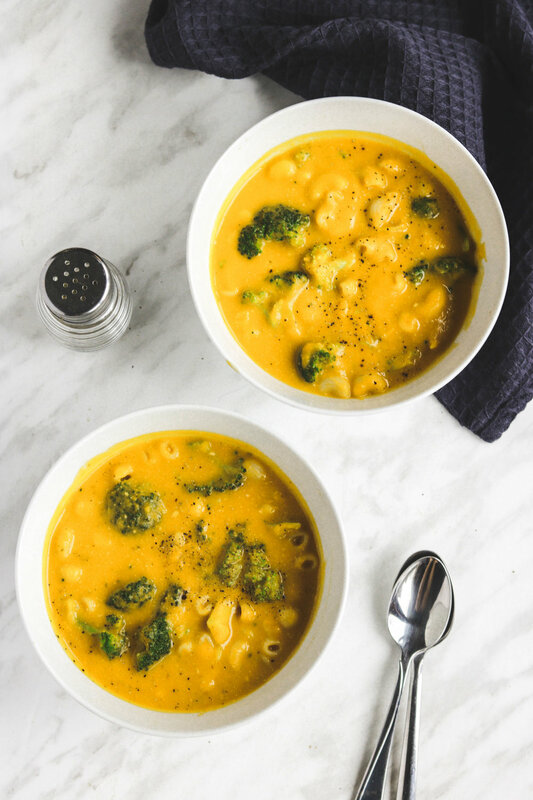 This Broccoli Mac and Cheese Soup is a combo of the two most comforting foods in the world: mac and cheese + soup! Using wholesome ingredients, this soup comes together quick and is completely vegan, gluten + oil free. 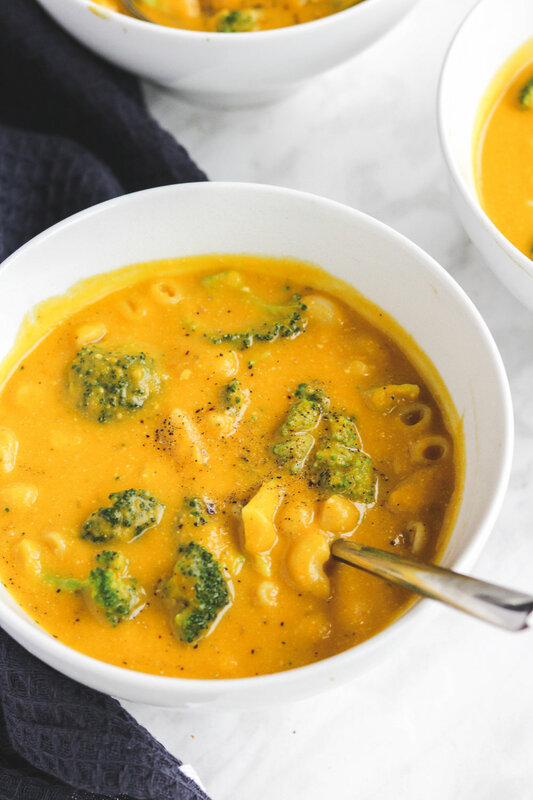 Broccoli Mac & Cheese Soup is a wonderful combo of the two most comforting foods: mac & cheese + soup! There is honestly nothing more warming then slurping soup and comforting than a bowl of cheesy mac. I love to bundle up in a blanket with a big bowl of this soup- the perfect thing to end off a cold day with. 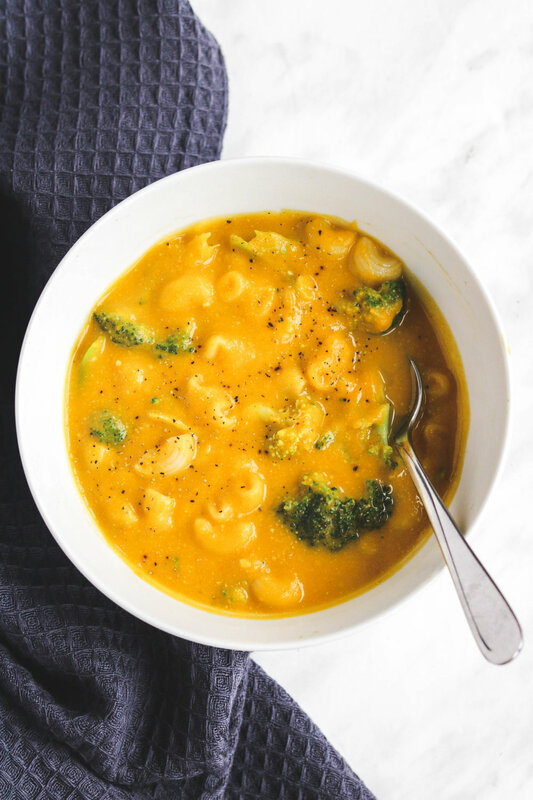 What I love about this Broccoli Mac & Cheese Soup is that it uses really simple & pantry staple ingredients! It’s super easy to make, relatively quick and doesn’t contain any gluten to thicken. If you recreate this Broccoli Mac and Cheese Soup please share it and let me know what you think by tagging me on Instagram @lisakitahara, I love seeing all of your tasty recreations! In a large pot, fry onions and garlic. Add the potatoes and carrots, and mix. Then add 2 c of broth to cover, simmering until potatoes are soft (around 15 mins). Transfer soup into blender and blend. Then transfer back into the pot. Blend 1 c of broth, cashews, nutritional yeast, paprika, ground mustard, lemon juice, miso paste and tomato paste until smooth. Add mixture into the pot and mix. Lastly, combine the streamed or roasted broccoli and cooked macaroni and mix. Add salt and pepper to taste.